CHICAGO: When performed in tandem, two molecular biology laboratory tests distinguish, with near certainty, pancreatic lesions that mimic early signs of cancer but are completely benign. The lesions almost never progress to cancer, so patients may be spared unnecessary pancreatic cancer screenings or operations. The two-test combination is the only one to date that can accurately and specifically identify these benign pancreatic lesions. Its utility was described in one of the largest studies of patients with this form of pancreatic lesion by researchers from Indiana University, Indianapolis. The results of the study now appear in an “article in press” on the Journal of the American College of Surgeons website in advance of print publication. However, the researchers determined that two proteins can play a significant role in ruling out precancer and cancer. Vascular endothelial growth factor A (VEGF-A) is a protein associated with promotion of new blood vessel formation. VEGF-A is upregulated in many tumors, and its expression can be correlated with a tumor’s stage. Its utility in the diagnosis of pancreatic cysts was discovered by researchers at Indiana University. Carcinoembryonic antigen (CEA) is a protein associated with cell adhesion. It is present in low levels in healthy individuals, but it is increased with certain types of cancers. Tests for each of these proteins in pancreatic cyst fluid have accurately distinguished SCN from other types of pancreatic lesions. In the present study, VEGF-A, alone, singled out SCN with a sensitivity of 100 percent and specificity of 83.7 percent, and CEA had a 95.5 percent sensitivity and 81.5 percent specificity. Together, however, the tests approached the gold standard of pathologic testing: The combination had a sensitivity of 95.5 percent and specificity of 100 percent for SCN. Authors of the study concluded that results of the VEGF-A/CEA test could have prevented 26 patients from having unnecessary surgery. “Every day, surgeons follow patients who have pancreatic cysts that have no risk of cancer but are still worrisome. They perform surgery or conduct diagnostic tests just to make sure they’re not wrong. With VEGF-A and CEA, we believe we may have invented a test that can help that group of patients who don’t have a risk of cancer get off the testing cycle and avoid surgery which, in and of itself, has a risk of mortality or complications,” said C. Max Schmidt, MD, PhD, FACS, study author and professor of surgery and biochemical/molecular biology, Indiana University School of Medicine. 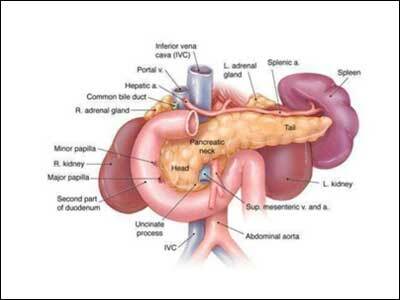 The study included 149 patients who underwent an operation to remove a pancreatic cystic lesion. Twenty-six of these patients had SCN. The diagnosis of each surgical specimen was confirmed by pathologic examination, and samples of pancreatic fluid from all patients were tested for VEGF-A and CEA according to testing protocols for enzyme-linked biochemical analysis of fluids. The accuracy of the VEGF-A/CEA test needs to be confirmed in large prospective studies. The test itself needs to be performed under quality control conditions. Until a central laboratory is created to meet standards for cystic fluid analysis, Dr. Schmidt recommends that pancreatic surgical programs send specimens to the Indiana University Health Pancreatic Cyst and Cancer Early Detection Center in Indianapolis. “Many investigators are looking for biological markers to help them understand which pancreatic cysts go on to form cancers. Our laboratory is doing that, but it’s also looking for markers to help determine which ones never have the chance of becoming cancers in the first place. These are benign, and they’re fooling us into thinking they could become cancers. If we can do that with confidence, we’ll find patients who can avoid potentially morbid surgery on the pancreas to remove something that never needed to be removed,” Dr. Schmidt said. In addition to Dr. Schmidt, Rosalie A. Carr, MD; Michele T. Yip-Schneider, PhD; Scott Dolejs, MD; Bradley A. Hancock, BS; Huangbing Wu, BS; and Milan Radovich, PhD, participated in the study. Prior to publication, study results were initially reported at the Western Surgical Association 124th Scientific Session in November 2016. This study was supported by the Indiana Clinical and Translational Sciences Institute funded, in part by Grant Number UL1TR001108 from the National Institutes of Health, National Center for Advancing Translational Sciences, Clinical and Translational Sciences Award, and by a grant from the Lustgarten Foundation and the Indiana Genomics Initiative of Indiana University, supported in part by Lilly Endowment Inc.
Citation: Pancreatic Cyst Fluid Vascular Endothelial Growth Factor A and Carcinoembryonic Antigen: A Highly Accurate Test for the Diagnosis of Serous Cystic Neoplasm. Journal of the American College of Surgeons.